Cover of Triumph-Adventure Comics No. 5 (Hillborough Studios, 1942) from The Digital Comic Museum. The earliest comic books, published in the U.S. in the mid-1930s, reprinted newspaper strips. But Superman’s first appearance in Action Comics in June 1938 ushered in a new age of super hero and adventure comic books. With kids in the U.S. and Canada eagerly handing over their dimes, the business boomed and the number of titles expanded. 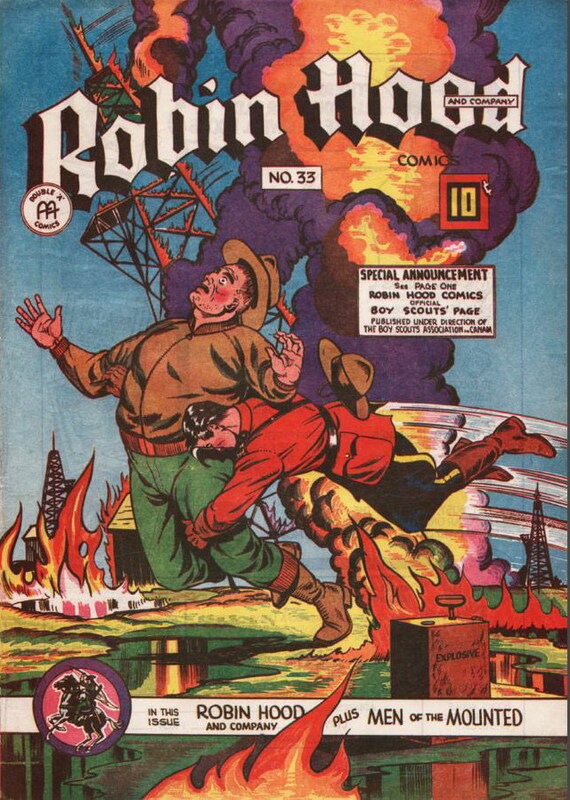 Prior to World War II, however, no Canadian companies had the wherewithal to compete with the major U.S. comic book publishers, discouraged by the prohibitive start-up costs in the printing business and the small Canadian domestic market. But on December 6, 1940, in a large-scale intervention in the economy, the federal government passed the War Exchange Conservation Act with the aim of retaining Canada’s foreign exchange credits for the war effort. The Act prohibited the importation of American comic books and periodicals, among other non-essential goods. With a sudden foothold in the market, four Canadian companies raced to fill the vacuum. Maple Leaf Publishing was based in Vancouver, but the other three majors—Anglo American, Commercial Signs of Canada (later Bell Features), and Hillborough Studios—were based in Toronto. Each released its first issues between March and September 1941. This period, which lasted until late 1946, was known as the Golden Age of Canadian comics, when the adventures of Nelvana of the North, Johnny Canuck, Freelance, and countless more-or-less forgettable characters delighted children across the country. Cover of Robin Hood And Company No. 33 (Anglo-American Publishing, 1946) from The Digital Comic Museum. Ed Furness, a Toronto artist who’d done a correspondence course in cartooning and then graduated from the Ontario College of Art in 1933, was working as a commercial artist in Toronto when Ted McCall asked him to draw comics in 1941. McCall had been a journalist at the Toronto Telegram who’d begun writing adventure comics in 1933. His Men of the Mounted and then Robin Hood and Company (drawn by two separate artists) appeared in the Telegram and in syndication across the country. Anglo-American Publishing had just reprinted his Robin Hood strips as the company’s first comic book in March 1941. And McCall was eager to have Furness illustrate his latest superhero creation—Freelance—for the company’s next release. Furness was hesitant about quitting his day job for an untried company, but agreed to draw at night for five dollars per page. Within six months, Freelance’s popularity prompted him to quit his day job for the gig full time. “I was enthralled by the whole prospect,” Furness is quoted by Robert MacMillan’s “Anglo-American Publishing Ltd: The War Years,” in John Bell, ed., Canuck Comics (Matrix Books, 1986). Although Anglo-American was run by four businessmen, McCall and Furness were the creative heart of the organization and invented characters like Dr. Destine, Purple Rider, and Commander Steel, whose adventures might find them fighting Axis enemies or in western or fantasy settings. Image from Triumph-Adventure Comics No. 1 (Hillborough Studios, 1941) from The Digital Comic Museum. Meanwhile, Adrian Dingle, and René and André Kulbach—three unemployed artists—found backing from a unnamed investor to form Hillborough Studios. 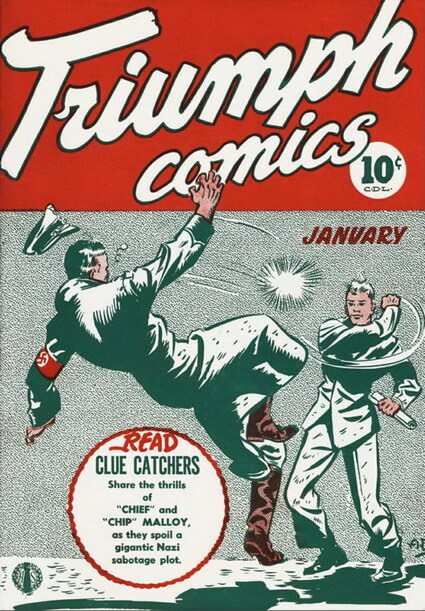 The company published a single title, Triumph-Adventure Comics beginning in August 1941. Dingle, who’d been born in Wales in 1912 and came to Canada at the age of three, had spent the 1930s working as an illustrator and graphic artist to support his ambitions as a fine-art painter. 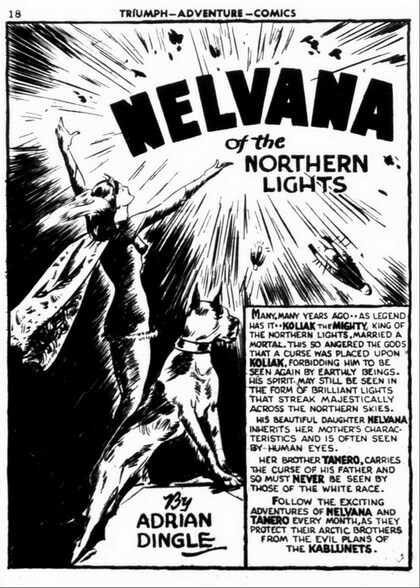 Considered one of the era’s best comic book artists, he provided one of the Golden Age’s most enduring heroes, Nelvana of the Northern Lights, a self-consciously Canadian hero where most earlier heroes—like Freelance—had been more generic. The Bells bought a second-hand offset press. 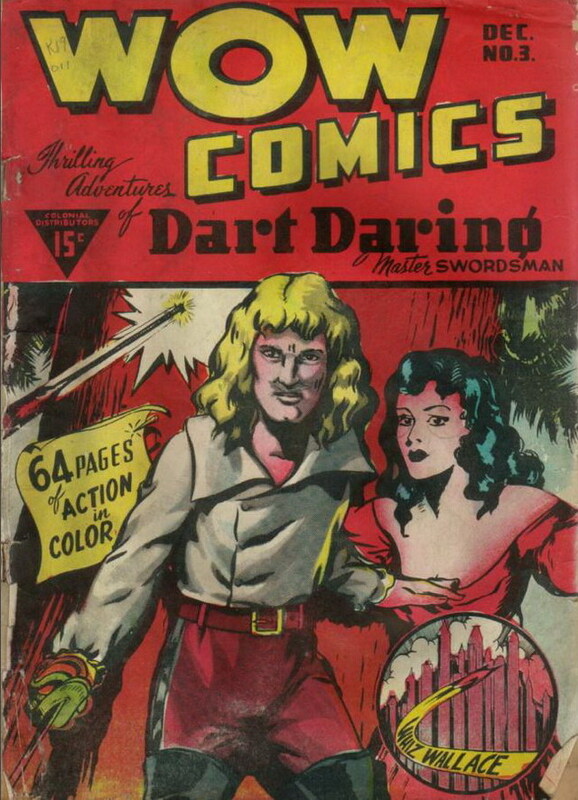 The adventures of Legault’s swashbuckling hero formed the foundation of the company’s first release, Wow Comics, in September 1941. This first issue was printed in full colour, which the Bells soon realized was a mistake. Full-colour printing was a labour-intensive process requiring the paper to pass through four separate rollers for red, yellow, blue, and black ink—a significant task for a press-run of fifty thousand copies or more. In the future, to save time and money, they first reduced the number of colours, then they reverted to the form most Canadian comic books took: full-colour covers and black-and-white interiors. Cover of Wow Comics No. 3 (Bell Features, 1943) from The Digital Comic Museum. For content, the comic books were usually digests of stories about several characters (although there were a few heroes who had dedicated books). There were also pages of “filler” that could range from gag cartoons to instructional charts for identifying aircraft, as well as some words-only short stories. With the enormous success of the first issue of Wow Comics—which sold out its initial print run of 52,000 copies—Cy Bell realized they’d need more artists than just Legault and began recruiting. These artists, in turn, recruited others until the staff grew to about sixty regular contributors for the company’s seven monthly titles. At Hillborough, the sales were unsatisfactory and, by early 1942, the company was absorbed into Bell Features (as Commercial Signs of Canada was by then known). Dingle became the firm’s artistic director. Others, however, thought the profession was less than respectable. Some had taken the job merely to escape the hardships of the Depression and, as Alexander Ross discovered while writing an article for Maclean’s in September 1964, many wished to have their participation in the comics industry remain anonymous. Filler Page from Triumph Comics No. 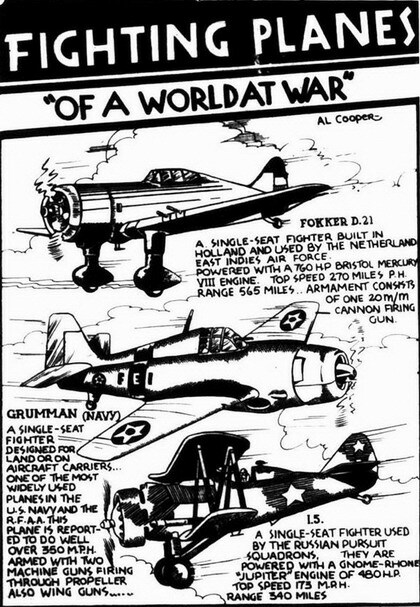 8 (Bell Features, 1942) from The Digital Comic Museum. Initially, Bell gathered all his contributors at 165 York Street, in a warren of cubicles that Bachle dubbed “the Black Hole of Calcultta.” He intended his supervision to keep them on task and on deadline. But many of the staff were still teenagers, and a guaranteed weekly wage was less conducive to productivity than it was an invitation for procrastination and shenanigans. Assignments were due on Mondays, when artists—bleary-eyed from all-night sessions to cram for the deadline—would arrive with their work. Bell never imposed a “house style,” and each artist was free to develop their characters as they saw fit. But this led to widely divergent quality of artwork from story to story. Bell and Dingle might praise or criticize an artist’s submissions but rarely rejected them since there was no time for revisions. Over in their offices at 172 John Street, Anglo-American was encountering similar quality control problems but solved them differently. With an insufficiently experienced staff of artists to keep up with production demands, the company had Furness draw character heads in a variety of poses on sticky paper. Then, less experienced artists could handle less important artistic details and simply affix the appropriate head onto a character’s body. 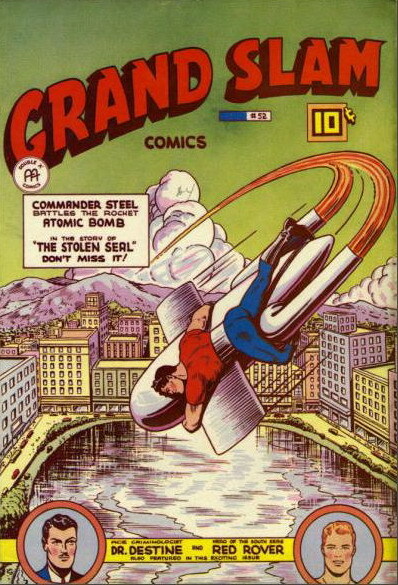 Cover of Grand Slam Comics No. 52 (Anglo-American Publishing, 1946) from The Digital Comic Museum. Despite being hampered by a chronic wartime shortage of newsprint and supplies, Bell Features became the largest and most successful of the Canadian comic book publishers. During its peak period, the company printed one hundred thousand comic books per week. The fraternity of comic book writers and artists usually convened in the beverage room of the Piccadilly Hotel on King Street. Over drinks, they’d talk shop and develop new ideas. Most of them worked week-to-week—without an overarching sense of where their stories were heading. So, at the Piccadilly, they’d brainstorm ideas for extricating their heroes from the previous week’s peccadilloes. “We used to help each other,” one Bell Features employee told Ross. “If The Brain was left hanging on a window ledge with a Nazi about to shoot him, we’d usually figure out a way to save him.” However, on one occasion, a major strip—Dixon of the Mounted—had to be abandoned by Bell Features because none of the creative team could figure out how to have the character escape from the bowels of the earth. As the war progressed, the Canadian comic book publishers realized that the wartime restrictions on American periodicals would eventually end. Faced with the prospect of competing with the higher production values of U.S. titles, Bell Features and Anglo-American began a period of rapid and expensive expansion of their enterprises to convert to full-colour printing for all titles, and to break into the lucrative U.S. market. But Bell’s expansion was stymied when he couldn’t secure enough newsprint paper (which was still regulated by wartime restrictions). Anglo-American found that sales could not be sustained. Both ceased to print original comic books in favour of reprinting U.S. issues, puzzle magazines, and colouring books. With that, the Golden Age of Canadian comics was over. At Anglo-American, Furness returned to his commercial art career and McCall returned to journalism (eventually becoming managing editor of the Telegram). Dingle became illustrated books and magazines and eventually became a well-known landscape painter. Bell operated a resort hotel at Crystal Beach, Ontario, until the mid-1960s, when he reopened a small-scale sign business. Bachle was among those Canadian artists who successfully transitioned to working in the American comic books industry. There would not be a comics book industry of note north of the border again until the creation of Northern Light and Captain Canuck ushered in the Silver Age of Canadian comics in the 1970s. Other sources consulted: John Bell, “English Canadian Comic Books: A History,” in John Bell, ed., Canuck Comics (Matrix Books, 1986).